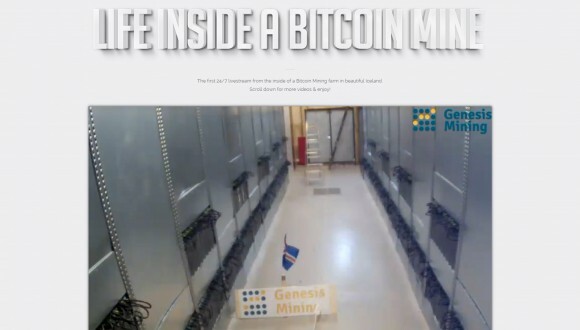 The Bitcoin cloud mining company Genesis Mining has launched an interesting project called Life Inside a Bitcoin Mine that shows live video feeds from one of the company’s mining farms located in Iceland. The website currently has 3 different streaming webcams that you can check from inside the Iceland Bitcoin mining farm as well as some additional information and other interesting videos. Watching at the live streams from the Bitcoin farm you may quickly get that it is not very fun being inside a mining farm as nothing much is actually happening most of the time when everything is working just fine. As many people don’t know how a mining farm looks and operates, we wanted to give everybody a clear idea about it and provide livestreams of a mining farm from Genesis Mining. Coupled with new, ongoing promotional events, we hope to make this a nice entertainment channel.